The Hellas Planitia region of Mars, where scientists believe small lakes came and went regularly. Before Mars became a forbiddingly cold and dry world, water once came and went smoothly on the planet's surface, just as it does here on Earth. Now, scientists have identified the traces of three different sets of these ancient lakes — some nearly 50 miles (77 kilometers) across. 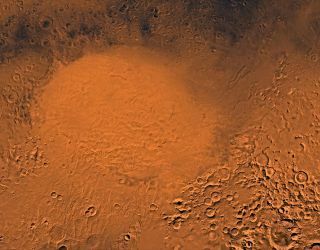 Those three sets of water bodies on Mars were likely each formed differently, the scientists behind the new research wrote. One class was formed directly by precipitation, one was fed by water moving through the Martian soil, and one was fed by rivers transporting water across the surface. All the studied lake beds are located in a region dubbed Hellas Planitia, the basin left behind by an ancient, massive impact. Many of these lake beds reminded the authors of similar features here on Earth. For example, one temporary lake resembles a feature in eastern Washington formed by a catastrophic flash flood. Another looks more like features along the Mississippi River, where water has flown for centuries. One sediment-filled lake even seems to mimic salty lakes high in the Andes, where it's permanently cold and dry. If the lakes were close enough to a source of heat, the authors wrote, they may have even been habitable. The research is described in a paper published Oct. 30 in the journal Astrobiology.